Dong Kingman was born Dong Moy Shu on March 31, 1911 in Oakland, California. At age five he returned with his family to Hong Kong where his father established a dry goods business. According to Chinese custom, Kingman was given his new name when he entered school. Hearing that he aspired to be an artist, his teacher gave him the name of King (scenery) and Man (composition). In later years he combined the two words into Kingman and following Chinese custom, he used the family name first and the given name second, thus Dong Kingman. At the Chan Sun Wen School, Kingman excelled at calligraphy and watercolor painting, and while his family, including his mother, an amateur painter, didn't encourage him, he pursued his love of art. He studied with Szeto Wai, the Paris-trained and head of the Lingnan Academy, who introduced Kingman to European trends and the Impressionists. "The young Chinese artist is showing twenty of the freshest, most satisfying, watercolors that have been seen hereabouts in many a day . . . landscapes and San Francisco street scenes, in which human figures appear incidentally, predominate in Kingman's exhibition. He handles his color fluently, in broad telling masses. He is completely sincere and never superficial. Here is a real watercolor painter." "Dong Kingman is bold, free and joyous as always. He paints with soaked light. He is San Francisco's A No. 1 watercolorist at the present moment." Frankenstein saw Kingman's early landscapes as "Mysterious and somber - more Chinese," but as the artist matured and focused on the city scene, there appeared a more "dramatic, excited and dynamic tone," easily identified with twentieth century urban living. Kingman's bold paintings of the urban scene, which was to become his main subject, were observed by writers and critics as a synthesis of his Asian heritage and his fascination with Western modernism. The artist successfully fused the two onto his unique style. Elaborating further, "I am Chinese when I paint trees and landscapes, but Western when I paint buildings, ships or three-dimensional subjects with sunlight and shadow." The artist characterized his style simply, "my way of painting." Beginning in 1936, Kingman was a participating artist in the Works Progress Administration (WPA) created by the federal government to help support the arts. In the next five years he painted prolifically for the relief program which not only helped artists financially, but also made America aware of its own art. In 1941 Kingman earned the first of two, back to back, Guggenheim Fellowships which allowed him to travel and experiment with the watercolor medium. During World War II he joined the army and was assigned to the Office of Strategic Service at Camp Beal, California and then Washington, D.C. The nature of his duties allowed him to continue his career. After the war Kingman settled on the East Coast, in Brooklyn Heights, New York, assuming teaching positions at Columbia University and Hunter College in 1946 for the next decade. His first one-man show in New York at Midtown Galleries in 1942 was well received in the media, including Time, Newsweek, The New York Times, the New Yorker and American Artist. M.H. de Young Memorial Museum in San Francisco held a major exhibit of his watercolors in 1945. In 1951, Midtown presented a 10-year retrospective of his work. Time Magazine wrote, At age 40, Kingman is one of the worlds best watercolorists. Other retrospectives, including Corcoran in Washington, D.C. and Witte Memorial Museum in San Antonio, were held for the artist. In the late 50s, Kingman moved from Midtown to Wildenstein where he had successful exhibits for over a decade in New York, London and Paris. In 1954 Kingman became a cultural ambassador for the United States in an international lecture tour for the Department of State. He was also a founding faculty member of the Famous Artists Painting School of Westport, Connecticut, joining artists such as Ben Shahn, Norman Rockwell and Stuart Davis on the faculty. Kingman became involved in the film industry during the 1950's and 60's where he served as technical advisor. In addition, he created brilliant main title backgrounds for such films as "55 Days in Peking" and "Flower Drum Song." Over three hundred of his film-related works are permanently housed at the Fairbanks Center for Motion Picture Study at the Motion Picture Academy's Margaret Herrick Library in Beverly Hills, California. 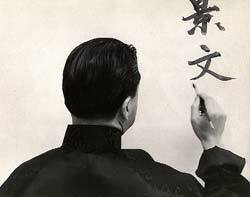 In 1981, Mainland China's Ministry of Culture hosted a critically acclaimed exhibition of Kingman's paintings in Beijing, attended by 100,000 people. It was the first American one-man show since the resumption of diplomatic relations between the U.S. and China. In the 90's, Kingman's paintings were the subject of two major exhibitions in Taiwan: the Taipei Modern Art Museum in 1995 and the Taichung Provincial Museum in 1999. Since his passing in May of 2000, several major exhibits have honored Kingmans artistic career. In the summer of 2000, the Academy of Motion Picture Arts & Sciences presented a special exhibition, Dong Kingman: An American Master in Hollywood. This was followed by the successful national touring retrospective, Dong Kingman: An American Master. From November 2001 to March 2002, the Chinese Historical Society of America and Museum and San Francisco State Universitys College of Creative Art co-sponsored a major exhibition, Dong Kingman in San Francisco, inaugurating the Societys new facilities in San Francisco. At the invitation of the Ministry of Culture, Peoples Republic of China, a new exhibition, Dong Kingman: Watercolor Master, opened at Beijing's National Museum of Chinese Revolutionary History mid-November 2002, then on to the Exhibition Galleries of the Hong Kong Central Library and concluded its China tour at the Shanghai Art Museum in early 2003. China International Exhibition Agency and Century Masters, Inc. co-hosted the exhibit. Major funding was provided by The Starr Foundation. Among his many awards and honors over seven decades, The American Watercolor Society awarded him its highest honor, the Dolphin Award, for outstanding contributions to art in 1987. He also received the Art Institute of Chicago International Watercolor Exhibition Award in 1941; the Audubon Artists Gold Medal of Honor in 1946; the Metropolitan Museum of Art Award in 1953, and National Academy of Design 150th Anniversary Gold Medal Award in 1977. From 1940 to present, Kingman's exhibitions, throughout the United States, have been almost yearly events and received by the public and press with laudits and critical success. In addition to the many honors and awards, and corporate and private commissions, Kingman's paintings enrich the collections of over 50 major public American museums and institutions. They include: Art Institute of Chicago; The Brooklyn Museum of Art; Butler Institute of American Art; Fred Jones Jr., Museum of Art, The University of Oklahoma; The Frye Art Museum; M.H. de Young Memorial Museum of Art; The Metropolitan Museum of Art; Museum of Fine Arts, Boston; Museum of Modern Art; the Pennsylvania Academy of Fine Arts; San Diego Museum of Art; Springfield Art Museum, and the Toledo Museum of Art.